Congratulations to ten Brean members on passing a three day first aid course. Derek and Craig George who will be competing in the 2017 European Championship held in Irland.in September. Our popular "Come and Try" sessions are running from October 1st 2016! Click on the tab above ("Come and Try!") for all the details on how to come down and enjoy the wind and beach! As of April 30th the summer sailing times are with us again so sadly no sailing until after 6pm to comply with local byelaws. Our new cameras have been installed! These are state-of-the-art cameras able to produce a much better resolution than can currently be seen but we are unfortunately hampered by slow broadband speeds until upgraded in our area. I think you will agree, what you can see now is a vast improvement on last year however. Many, many thanks to Anthony from Moore Broadband Solutions for all his hard work and continuing support, we do appreciate it! Well our first club sailing went well, 5 racing with Martyn and Roger spectating with 2 others. We only got 2 races in due to weather and tide but l think all enjoyed themselves. The next club racing will be January 24th (Sunday) with a 10:30 start. Thanks again to all who supported today's event and have a good Christmas and a windy new year. Please note! 30th November- 11th December! The beach access ramp next to the club will be closed from 30th Nov - 11th Dec due to a rebuild. Access can still be gained to the beach however, from the ramp at the end of the road towards Brean Down. This is also listed on the Club calendar. 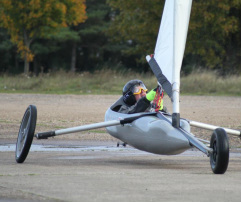 Club Trophy racing weekend 10th/11th October 2015! All classes. A bit of fun! 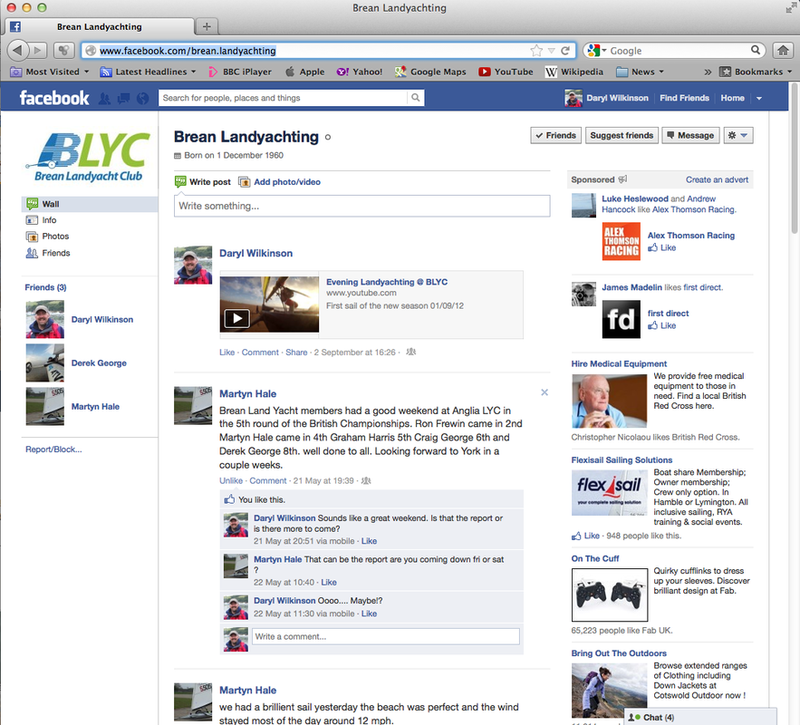 Unfortunately the new season starts with the BLYC website cameras not working as well as they should. We are in consultation with suppliers and normal services should resume shortly as we know you like to see who's doing what on the beach! Davis WeatherLink Mobile Brings the Davis WeatherLink Network to your Android phone. 2014 Brean Member Derek George takes British Championship with son Craig coming joint second with Anglia LYC John Pickstone. This is a belated congratulations to Martyn Hale for his fantastic performance in the 2013 British Championships. ( the web master was asleep at his post ). 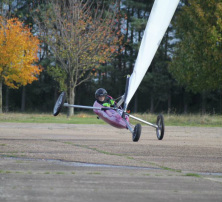 Martyn sailed brilliantly to secure his first place, especially when you consider that Martyn has a 'gammy' knee and shoulder which really restricts his starting! But of course all the regulars at BLYC experience his 'Yoda' like sailing skill week-in, week-out. And we know he is a tough guy to beat! Well done Martyn... Hip Hip Hooray, Hats in the air... and all that stuff! This weekend is the last one this season. 29th / 30th June 2013. We will be sailing on Friday & Saturday. The forecast looks ok for both days. The Club will be hosting a Bar-Be-Que on Saturday so come on down grab a last sail of the Summer Season and enjoy a burger or two! Bring some burgers or whatever takes your fancy with you and see out the season. Hope to see you there. By all accounts a VERY COLD weekend! With mostly marginal wind conditions coming from the North East at around 10mph made the sailing tricky but interesting. Top marks to Craig George for his great 2nd place. What a great result from one of our teenage members in challenging conditions! Well done Martyn, Derek and Craig for achieving a BLYC Standart Class 1,2,3 at this weekends British Championship Round 2 - Anglia Regatta. Especially as from the weather reports I've seen it was a difficult weekend with 30 knt gusty winds on Saturday. So much so your webmaster chickened out! Standart - 1st Martyn Hale, 2nd Derek George, 3rd Craig George. Go HERE to join the conversation! Log in with your Facebook account or create a profile. It's super easy! Whilst you are doing that you may as well post your pics on the clubs Facebook Page! Come and say hello! and saw... Derek, Roger, Martyn, Daryl, Craig, Jack and Peter. They may be mini but Caroline Hart was almost very mighty. Racing to a fantastic Bronze medal position in the ladies Mini Yacht World Championship. It's obvious Caroline will have to start coaching at BLYC because there's going to be a steady stream of pilots asking to tips! Well done Caroline. All Hale the (almost) conquering hero! Well done all the rest of the Brean Landyacht Club members that sailed in the 2012 World Championships (www.mondial2012.com). Especially Martyn Hale (Sailing Master) for his sterling effort in finishing the top placed British team member in the Standart class. With three top ten finishes Martyn's final place was 16th. Martyn was closely followed by Ron Frewin who finished 18th. And a special mention for Dave Green (not a BLYC member) who placed 4th overall in the Mini Yacht regatta. Well done guys! We have just taken delivery of our new 'Seagull Silence' Mini Yachts. 'Seagull Silence' Mini Yachts for club members to use. They are to 'FISLEY' Specifications and will be ready to race in all mini yacht regatta's. Delivery is expected at the end of January.